Paul Ryan & wife “wash” aleady clean dishes for a fake photo op in Youngstown, OH. Upon entering the soup kitchen, Ryan, his wife and three young children greeted and thanked several volunteers, then donned white aprons and offered to clean some dishes. Photographers snapped photos and TV cameras shot footage of Ryan and his family washing pots and pans that did not appear to be dirty. According to a Romney aide not authorized to speak publicly about the event, the campaign followed its usual protocol for impromptu, on-the-road stops by candidates: A staffer was dispatched to the St. Vincent De Paul Society ahead of Ryan’s visit Saturday morning and spoke with a woman in charge on site, who said that it would be fine for the congressman to stop by. The campaign did not contact Antal ahead of the visit. The woman on site told the Romney staffer that some of the volunteers had already left, but that most were happy to remain until Ryan arrived, according to the aide. After Ryan left the soup kitchen, the woman approached a campaign staffer and expressed gratitude for Ryan’s visit, the aide said. 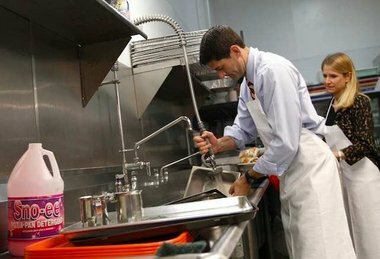 GOP Vice Presidential Candidate Paul Ryan pretends to be washing dishes at a Catholic charity soup kitchen. Chris Maloney, Ohio communications director for the Romney campaign, said that the visit by Ryan had been intended to highlight the work of the soup kitchen volunteers. “Our campaign and Congressman Ryan were pleased to bring attention to the meaningful charitable contributions the St. Vincent De Paul Society makes to people in need,” Maloney said. He noted that the soup kitchen relies on funding from private individuals who might reconsider their support if it appears that the charity is favoring one political candidate over another. He added that the incident had caused him “all kinds of grief” and that regardless of whether Ryan had intended to serve food to patrons or wash dishes, he would not have allowed the visit to take place. YOUNGSTOWN, Ohio — Paul Ryan visited a soup kitchen here Saturday on his way to the airport, but by the time the GOP vice presidential nominee and his family had arrived shortly before noon, the grits, sausage and doughnuts had been served, the hall was empty of patrons and the volunteers appeared to have already cleaned up. When Ryan did talk to some men who appeared to be homeless, as he did when he left the venue, reporters were not allowed to listen in on the exchange. The visit by Ryan came after a town hall meeting Saturday morning at Youngstown State University. After greeting and thanking a handful of volunteers from St. Michael’s Catholic Church in Canfield, Ohio — who said they typically visit the St. Vincent DePaul Society every Saturday and serve food from 10 to 11:30 a.m. — Ryan, his wife and their young children headed to the kitchen, donned white aprons and offered to clean up some dishes. A few minutes into the dishwashing, reporters were escorted out of the building and onto a press bus. As Ryan exited the building some minutes later, a small group of people, some of whom appeared to be homeless, seemed to engage Ryan, and the candidate stopped for several moments and spoke with them. The campaign escorted photographers from the bus for Ryan’s exchange, but reporters were not allowed to do so. Ryan’s motorcade took off for the airport a few moments later. A campaign aide said that the exchange was not open to press because it was an impromptu conversation. Ten volunteers had served 180 people at the soup kitchen before Ryan arrived Saturday, the aide said. “Breakfast service at the soup kitchen had ended during the town hall at Youngstown State,” he said when asked why Ryan had stopped by the venue after food had been served. This entry was posted on Monday, October 15, 2012 at 11:58 PM	and is filed under - Faith, Religion, Goodness - What is the Soul of a man?, - Lost In Space: TOTALLY Discombobulated, - Politics... that "dirty" little "game" that first begins in the home., - Read 'em and weep: The Daily News. Tagged: Catholic, Chris Maloney, faith, fraud, GOP, hypocrisy, hypocrite, Jesus, liar, Mahoning County Ohio, Mitt, Mitt Romney, Ohio, Paul Ryan, religion, Republican, Romney, Romney Ryan, Ryan, Saturday, Society of Saint Vincent de Paul, Soup kitchen, Youngstown State University. You can follow any responses to this entry through the RSS 2.0 feed. You can leave a response, or trackback from your own site. I saw that, Oh my God and even have his kids in the acts. That is so disgraceful. I don’t care what parties each and every one of us is pulling for no one can say its right for what he has done. Hi Netty! Thanks for reading, and for sharing your thoughts! Yes, it is despicable hypocrisy of the worst kind. The hypocrisy lies with you and ‘netty’ !! when a monster like ‘ahmadenijad’ can visit new york and you have no problem with that but when a ‘sitting united states congressman’ who happens to be a good decent family man and a roman catholic to ‘boot’ visits a ‘catholic soup kitchen’ you are outraged and appalled. The insanity and disrespectful behavior of you ‘left -wing loons ‘ is disgusting. Hi Betty! Apologies on the tardy response. Things have been quite hopping lately, you understand! When Iranian President Mahmoud Ahmadinejad was – as you worded it “visit New York” – it was to address an assembly of the United Nations. Naturally, I presume you knew that already. Doubtless, others as well as I, would be interested in reading your thoughts as they pertain to those objectives toward which this nation, and others, work – as well as the reference Scripture cited before the article. Thanks!